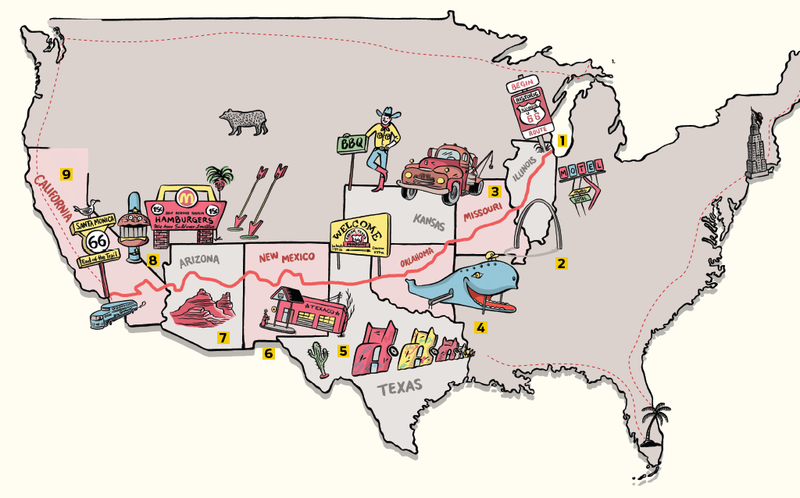 What is legal about Route 66? Why did she become famous? Inaugurated in 1938, Route 66 was part of the US national highway plan, which established 96 highways. The north-south routes would be odd and the east-west routes would be even. The numbering increases in these same directions, that is, route 1 starts at the eastern end and 98 is the last, more to the south. 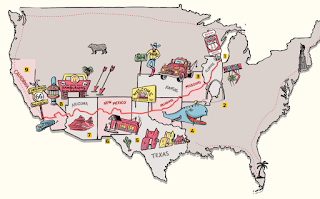 The original route of the 66 was about 4,000 km long, crossing nearly 200 cities and eight American states, going from Chicago, Illinois, to Santa Monica, California. The exact medium is identified by the "Mid Point" sign. From there, it is about 1,830 km to each of these two cities. Today, many stretches of the route have been absorbed by expressways. There are still original passable pieces, but they do not go anywhere. Hundreds of moteis still stand at its edge; Some still in operation, and others only with the facade preserved for tourists to photograph. The tour begins in the state of Illinois. But the zero-frame plate has changed place throughout history. Today, it's on Adam Street with Michigan Avenue in Chicago. In this section, the tourist route includes the Eagle Hotel, the first road motel, opened before the route , and the 66 Museum , one of the most complete on the road. The route became famous thanks to Easy Rider (1969). In the movie, two friends travel by motorcycle from Los Angeles to New Orleans for the Mardi Gras party. But other hits have also happened there, such as Forrest Gump (1994) and Blow of the Master (1973) and the series Route 66 (1960). It has other connections with film culture: a drive-in in Missouri. At 66 Drive-in Theater, you can watch an open-air movie from inside the car. In the same state is also the highest monument in the USA: the Gateway Arch, in Saint Louis, 192 m high. The road was also immortalized by the greatest writer of the beat generation, Jack Kerouac. He spent seven years touring the road and writing On the Road . The book turned film, directed by the Brazilian Walter Salles, in 2012.